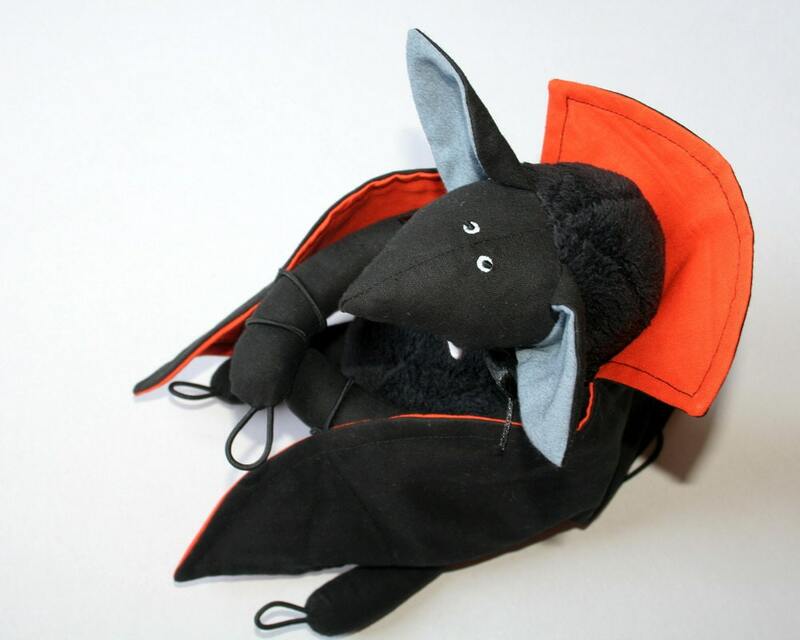 This cuddly soft plush toy is Bela, the Vampire Bat. He is named after Bela Lugosi, the famous Hungarian-American actor, the real Dracula. 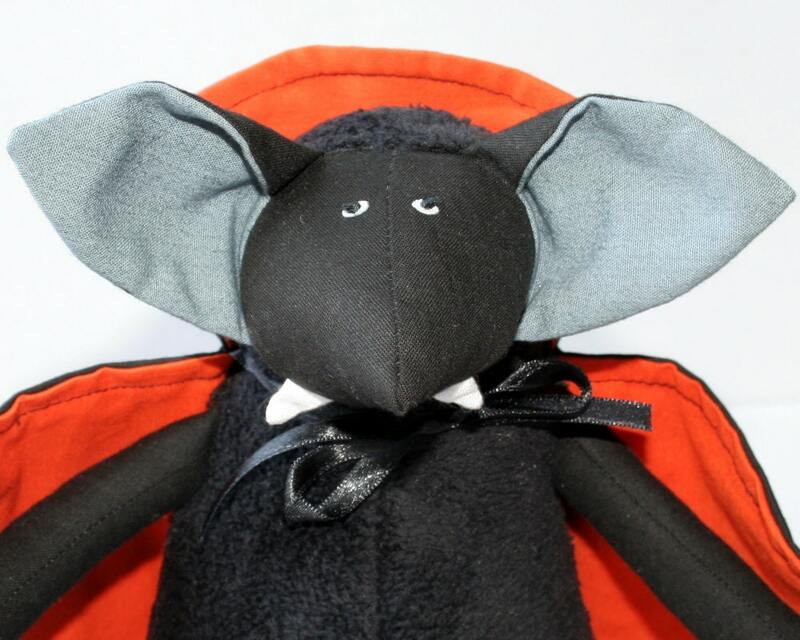 Bela the Vampire Bat is a soft black cuddly vampire and he has big white teeth. He can get off his wing-coat (as you can see on the fourth picture) when the weather is sunny and warm, but can take it on in the dark night. He can close his wings when it is cold. His wing-coats lining is vibrant orange, but you can choose another wing-coats - now you can choose green, blue or red spare wing-coats (last picture). Bela has gigantic grey ears. Bela has elastic loops instead of his claws, so he is not dangerous at all. He can sit down but he prefers to hang on a tree. He can hang either by his arms or legs. Bela the Vampire Bat is my own design. He is made of black fluffy plush and black canvas. 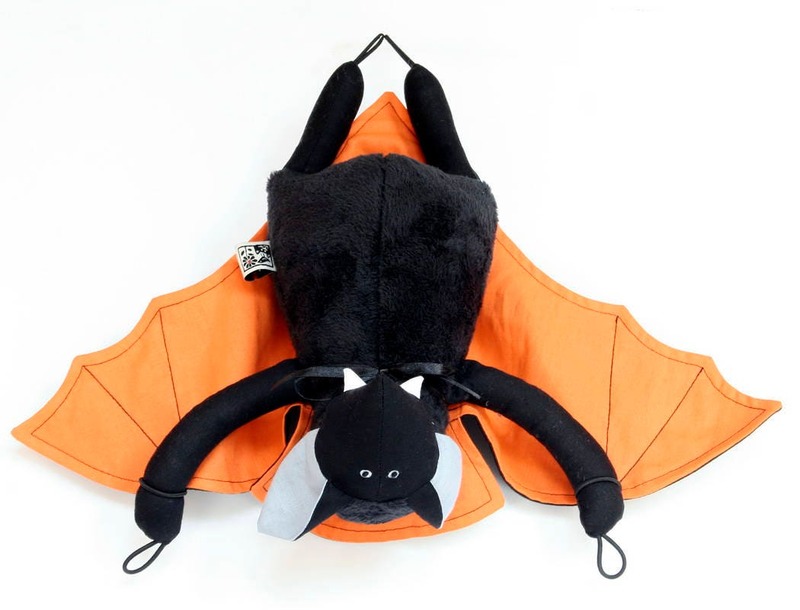 The wing-coat is made of black and orange canvas. The wing-coat can be attached to Bela's body with black ribbon and elastic loops. If you would like to order wings of any other color instead of the orange one, please message me. He is funny toy for children or bigger ones, or charming Halloween decoration. He is washable in wash-machine. He is 14,5" (36 cm) from head to toe, 10" (25 cm) seated, and 14,5" (36 cm) from claw to claw at his arms. His wing-coat is 21" (53 cm) wide. Articolo perfetto, più bello di come me lo aspettassi. Fatto benissimo e con ottimi materiali. Consegna puntualissima. Tutto perfetto. Darling Halloween decoration. Thanks, Andrea.